I love Vintage, How about you?? Salt On The Rocks Giveaway! Oh, yay for sunflowers! This dress is beautiful, and I LOVE your hair! I really love that little bag, too. So cute! florals in general are amazing but i do LOVE your sunflower dress! Gorgeous dress and bag! Love this outfit! Gorgeous dress. You layered it so well too. well, i think it looks just right in the spring! (and any other time for that matter.) i definitely have a habit of wearing florals year round...i think they do a lot (along with colorful stockings) to brighten up a blustery, wintery day. no shame in that. xo. I can barely contain my hair envy. great photos! really like your look!! Every time I see one of your photos on lookbook I can't help but notice we both have curly layered hair, a full fringe, a nose piercing and heavy eyeliner! So needless to say, I'm a total fan of your look haha! such a cute outfit, I love the dress. You look so gorgeous. Haha, yeah, sunflower print just makes me smile. I love this dress! love the colour of your scarf!! Awh! So cute! Its hard to find a cute mini floral dress, but you did it! Love this outfit! Such a cute dress and those sandals are gorgeous!! I Love that hair, i love that bag. I love your blog as always. sunflower dresses always are cute for spring :) i love love this look! Such an lovely outfit for springtime. 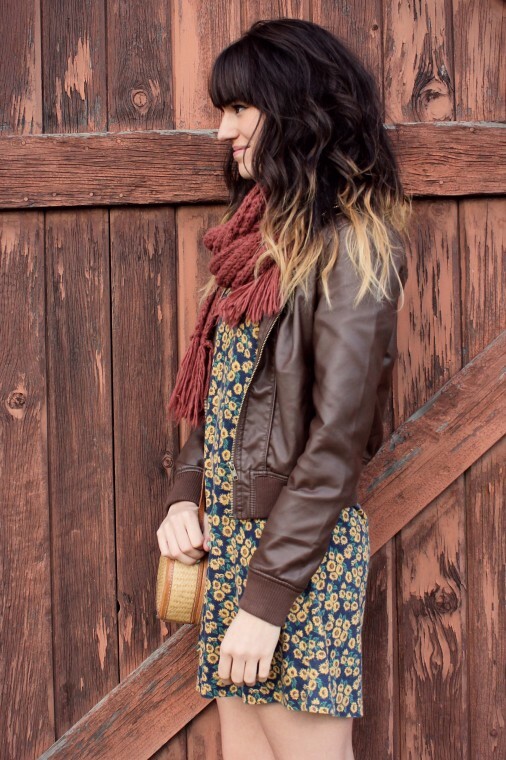 I adore the brown jacket with the sunflowers. It's such a grounding, earthy effect. This outfit ACTUALLY took my breath away. I really really need to find a dress like this! What a great blog! I literally love all of your outfits!